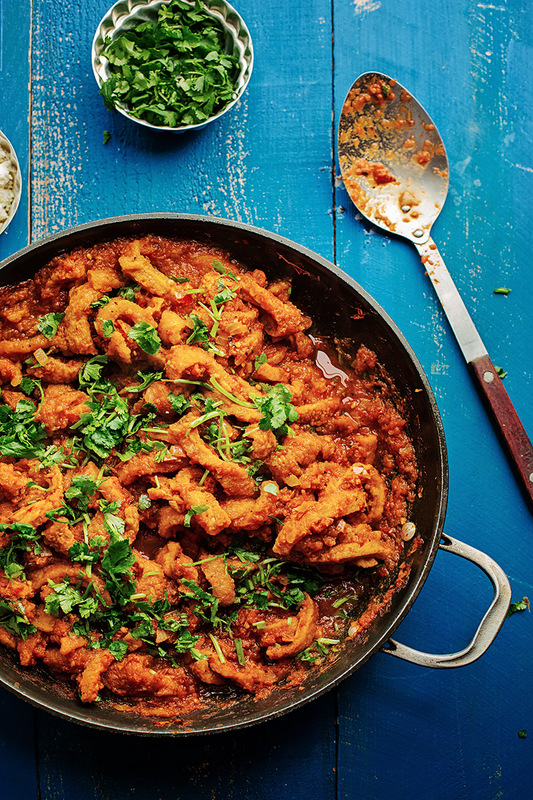 "Chicharrones en salsa" varies slightly from family to family but the heart of it remains the same. 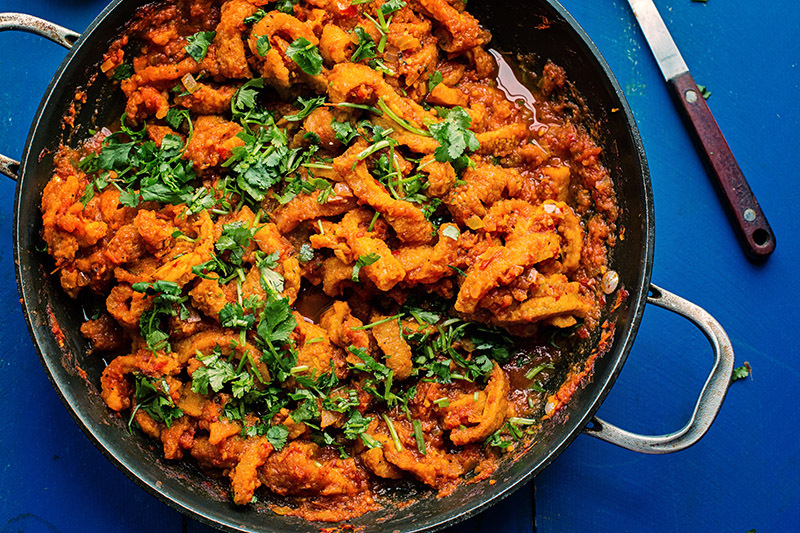 Pork rinds are stewed with chili peppers and fresh tomato sauce until tender. They can be served in tacos, burritos, over rice and beans or served with a fried egg for breakfast. The phone ringing finally got me out of bed. It was a Friday. I don’t have to be at work until 11 a.m. on Fridays so I usually have a bit of a lie-in. “Ani?” It was my niece. “Hi sweetie, what’s up?” She was at the market in my neighborhood, just a few blocks from the house. I rattled off a couple of brands and 15 minutes later, she was knocking at the door. “No,” she answered. She had just been over a few days earlier in the week to help my grandmother with a few things. My niece said she had sensed that Grandma was feeling a little lonely during the day and wanted to come spend time with her when there was nothing that needed to be done other than just have breakfast and listen to her share her stories. Sweet, right? It was also quite coincidental as just two weekends before I had made chicharrones for this post and had finally found something that piqued my grandmother’s tastebuds. She hadn’t been eating much but managed to polish off half the leftovers herself. Chicharrones in a red or green salsa is a really common dish in most Mexican households. My parents made it frequently when I was growing up as it’s a filling and economical dish to make, especially for a household with five kids. Even though it’s a super common dish, you’d be hard pressed to find it served at a taco shop or even at a sit down Mexican restaurant. When I had my friend Joanna over to help me make it for this post, she even commented that she hadn't heard of this dish but after seeing how easy it was to prepare and tasting it for the first time, felt it was a kind of “food for the soul” – meaning, a simple comfort dish that one would find in the kitchen of someone's home not on a menu in a restaurant. I couldn’t agree more. My parents used regular pork rinds that you can find in the chips section of nearly any major grocery store ($2 a bag!). I prefer the smaller, curly chicharrón botanero you can find at an ethnic market. This variety isn’t light and airy like the national brand varieties but are thicker, harder and some pieces may retain pork belly meat. This recipe made with this kind of pork rind makes for a chewier, more satiating eating experience once it’s stewed in the salsa. But certainly if you don’t have access to a market that sells Hispanic foods, regular pork rinds will work just fine. 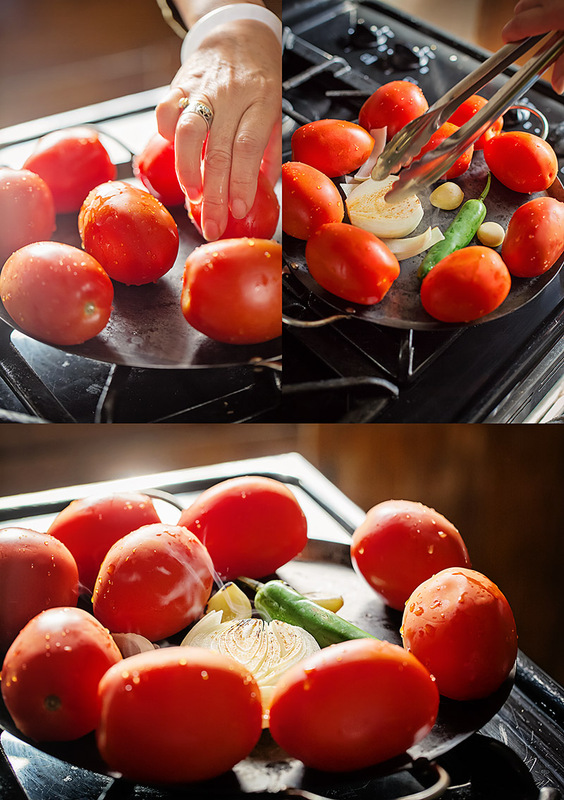 Today I’m sharing my version in an easy homemade red salsa. I also have a salsa verde variety waiting in the wings that I’ll probably share after lent. In the meantime, I hope you enjoy this look into a traditional Mexican meal. I’ve made it into tacos here serving them on corn tortillas, but you can eat it over rice and beans. This also makes for an excellent breakfast paired with a fried egg and fresh tortillas. Scroll to end for printable recipe. 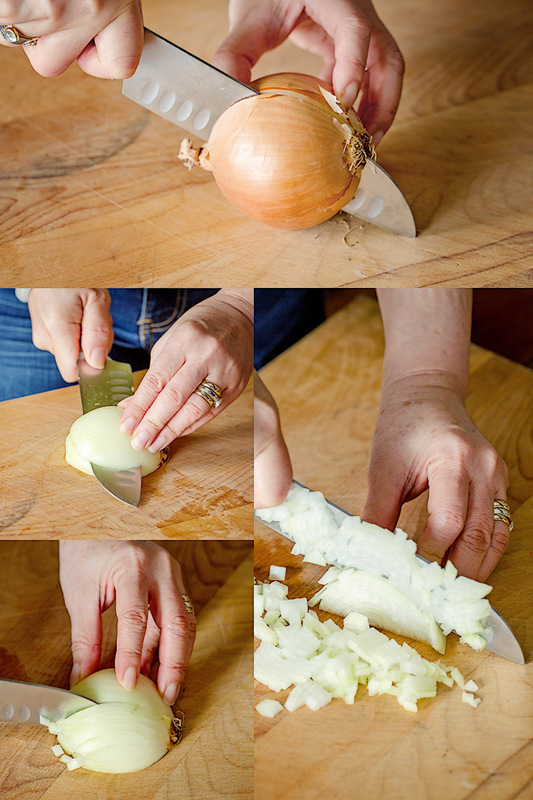 Start by prepping the onions. Finely dice half a large onion. From the remaining half, slice off about a ½-inch thick slice. Set both aside. Next, wash and dry two dry California chiles (guajillos would work well, too). 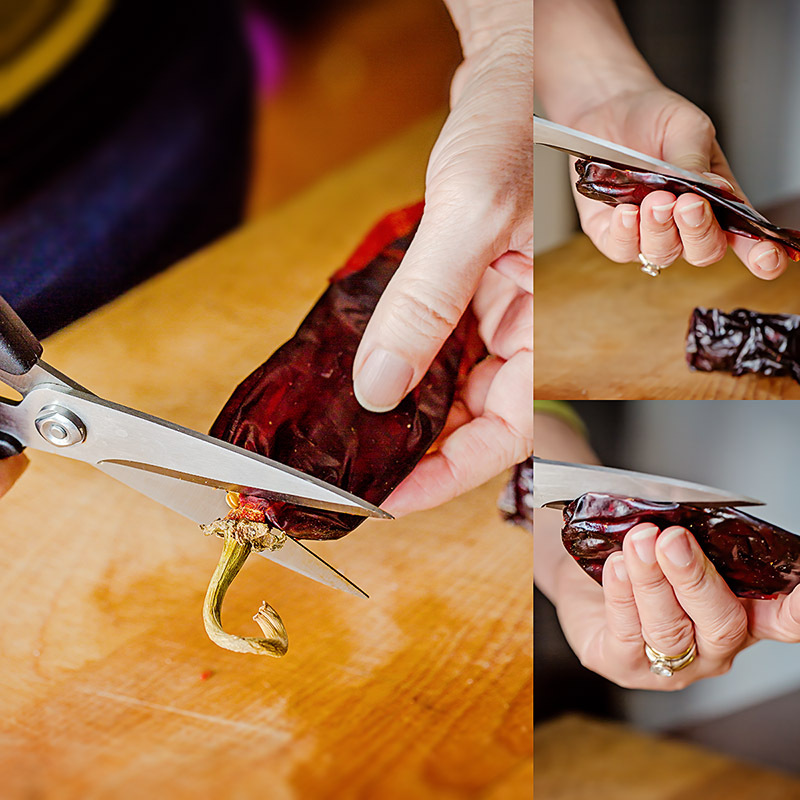 Trim off the stem and cut down one side lengthwise to open and get access to the seeds and veins. Remove the veins and scrape out the seeds. 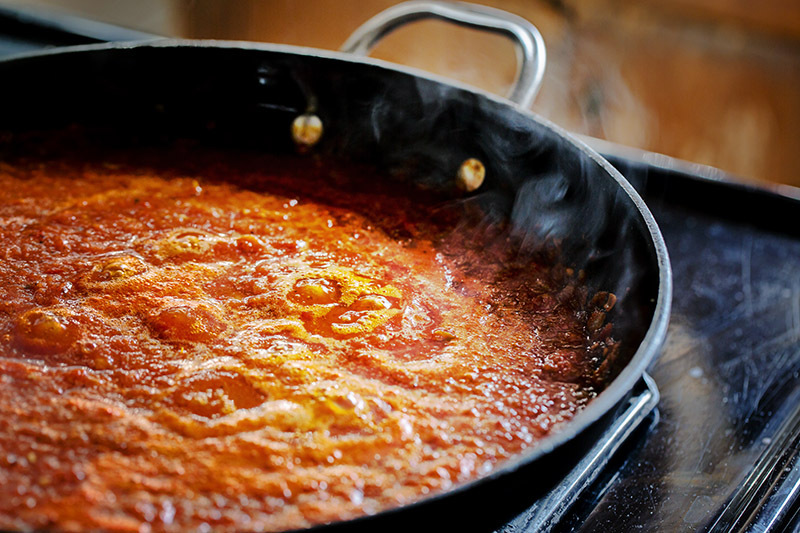 Fill a small sauce pan with water and bring to a boil. Heat a griddle or cast iron skillet on medium-high heat. Once the griddle is hot, place the chiles on the griddle and toast about 30 seconds on each side. The chiles will start to deepen in color. Don't walk away. You don't want the chiles blackened as they will burn easily and become very bitter. Remove the chiles to the boiling water. Cover, turn off heat and allow to steep while you prep the tomatoes. Add the tomatoes, onion slice, serrano chile pepper and garlic cloves to the hot griddle. Cook until mostly charred, flipping the vegetables as needed to ensure even charring. The onions and garlic will be the ready first. Remove them to a blender jar. 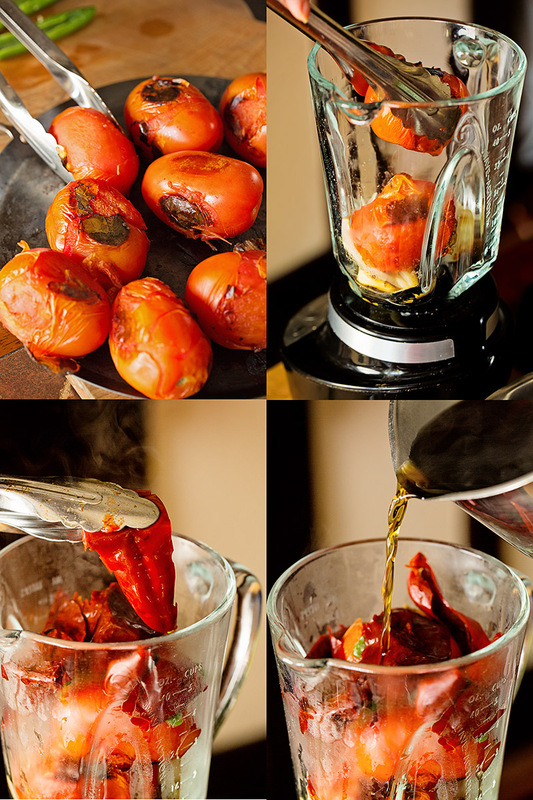 As the tomatoes blacken up, remove them to the blender jar, as well. Add the chiles and about a 1/4 cup of the chile steeping water. You might have to work in batches. Here, we added half the tomatoes with all the ingredients, blended until smooth and then added the rest of the tomatoes. Be sure to remove the top round part of the lid and cover the hole with a kitchen towel before blending. Next, heat a 12-inch skillet to medium heat. Once hot, add 2 tablespoons of vegetable oil. Add in the onions and sweat until translucent. Stir in 1 tablespoons of powdered chicken bouillon (I use Knorr). Pour in the blended salsa. Let simmer on medium-low for 15 minutes. Working in batches, add in the pork rinds. Simmer on medium-low for 25 minutes. 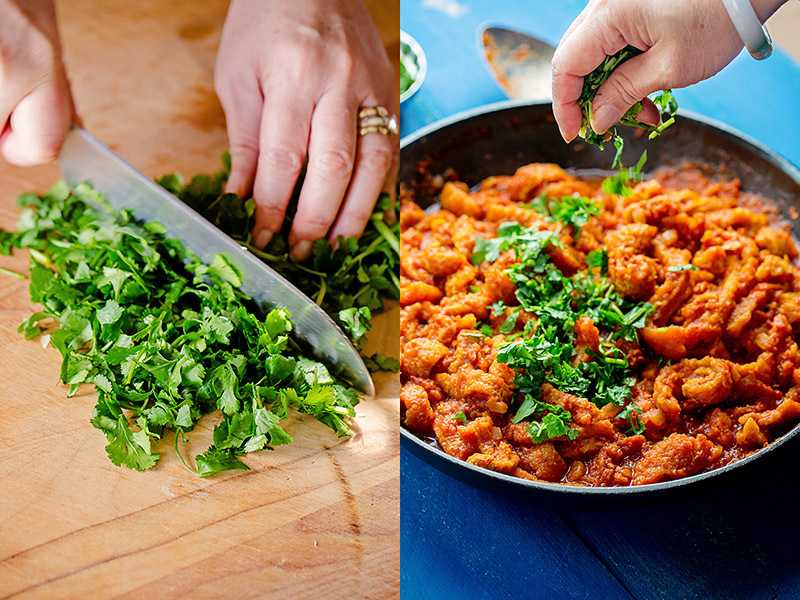 Optionally, stir in a half cup of chopped cilantro just before serving. This is my version of a very traditional Mexican dish. "Chicharrones en salsa" varies slightly from family to family but the heart of it remains the same. 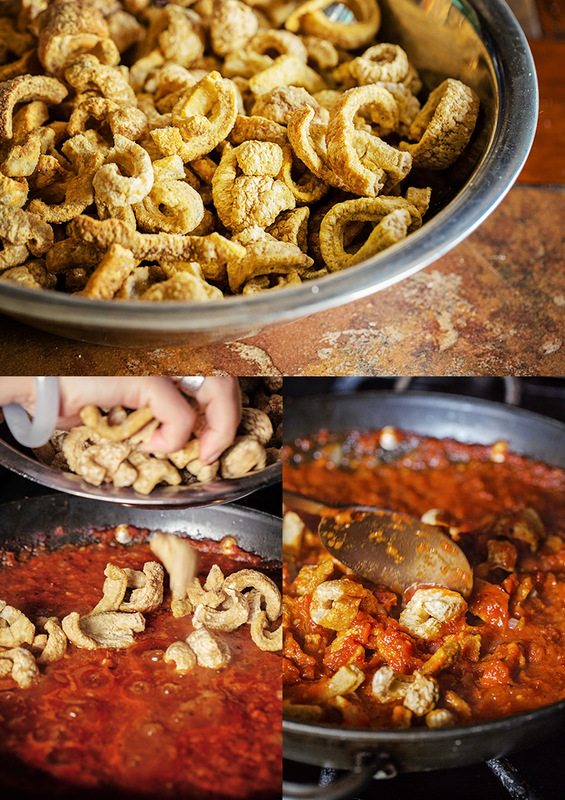 Pork rinds are stewed with chili peppers and fresh tomato sauce until tender. They can be served in tacos, burritos, over rice and beans or served with a fried egg for breakfast. Finely dice onion; set aside. 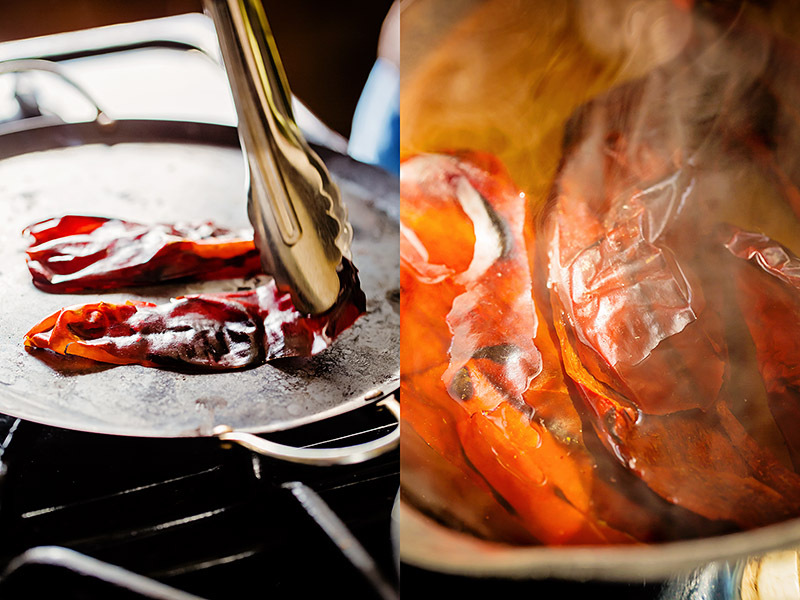 Bring a small sauce pan of water to a boil. Wash and dry chili pods. Trim off the stem. Slice open and remove seeds. Heat a griddle or cast iron skillet to medium-high heat. 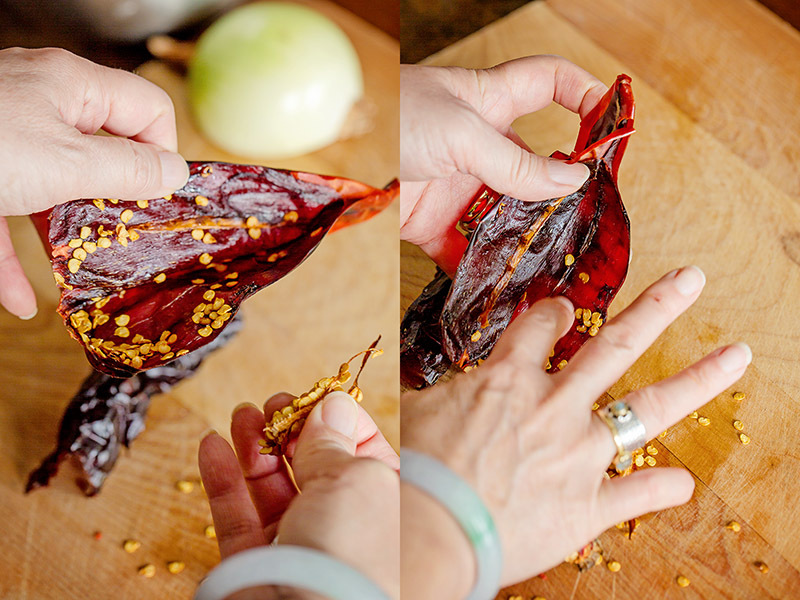 Toast each chili pod for 30 seconds on each side, remove them to the boiling water. Cover pot, turn off heat and allow to steep so they soften.Place the slice of onion, garlic, and serrano chili pepper on the hot griddle. Char on all sides, removing them to the blender when ready. Add the tomatoes to the hot griddle. Char and blister on all sides, adding them to the blender once charred. 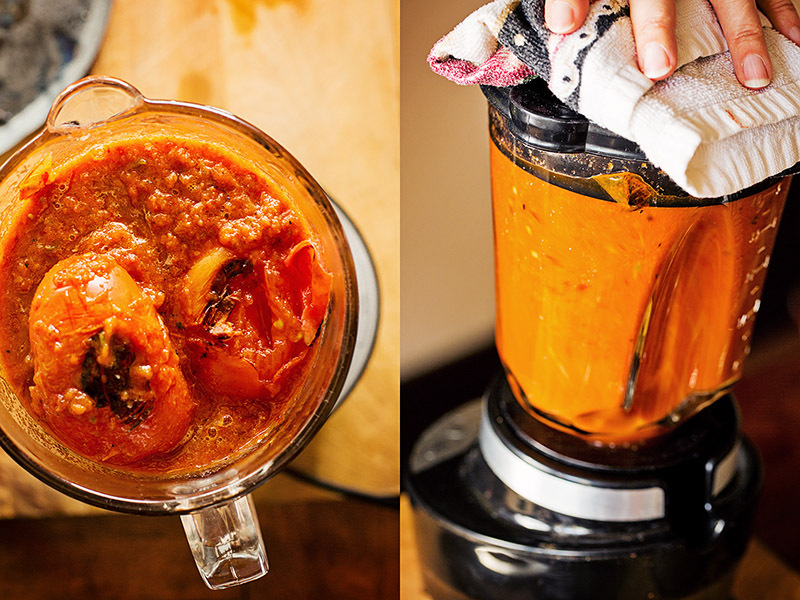 Add the now softened California chili peppers to the blender and a 1/4 cup of the steeping liquid. Blend until smooth. (Work in batches if needed.) Heat a 12-inch skillet to medium high heat. Add oil. 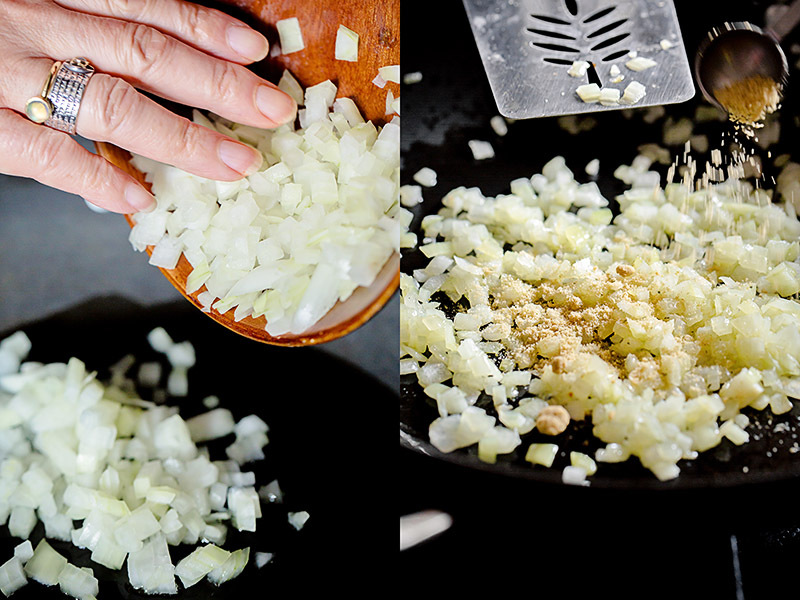 Once shimmering, add the diced onions and sweat until translucent. Stir in bouillon. 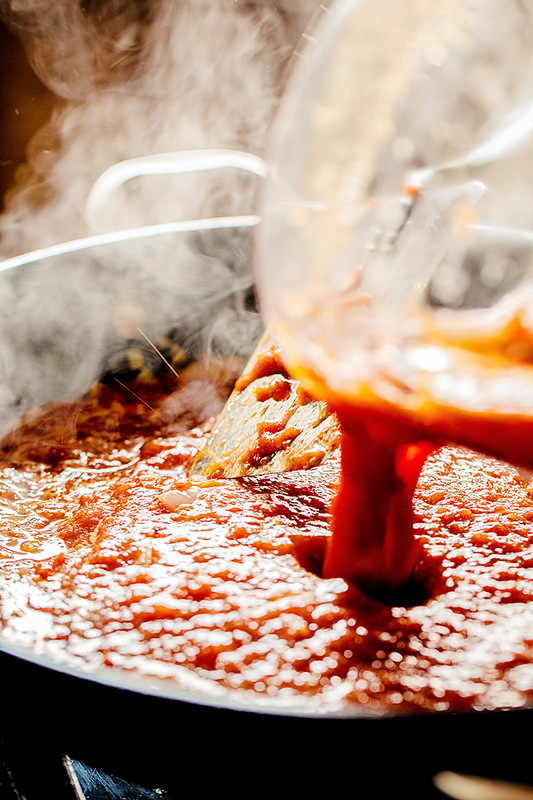 Pour in the tomato chili mixture and simmer on medium-low heat for 15 minutes to thicken and develop flavor.Stir in the pork rinds, working in batches if needed, until all are coated in sauce. Allow to stew for 20 minutes. Taste and add more bouillon if needed. Stir in the chopped cilantro. 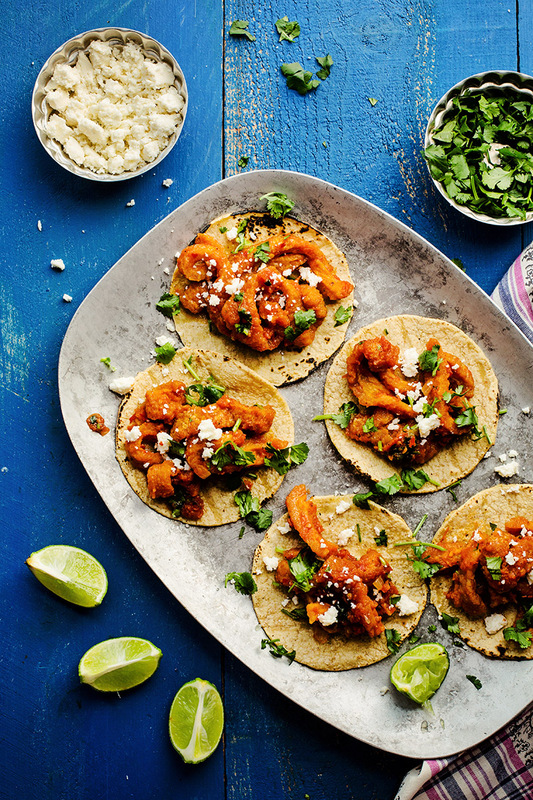 Serve in warm tortillas with queso fresco, more cilantro and a squeeze of lime, if using.